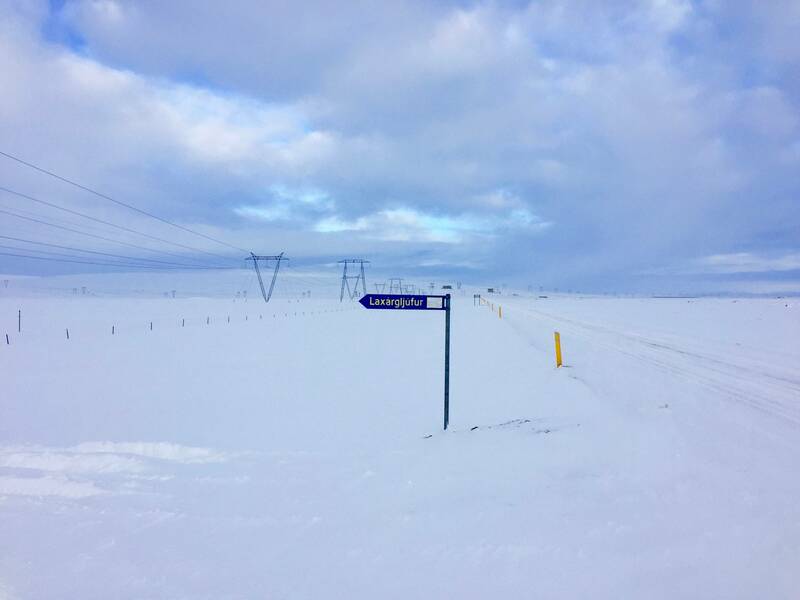 Iceland, March 2016. An adventure in the world of ice and fire. Refreshing seven days self-driving around the island. I have longed for Iceland since junior year. Last spring break, with my friend Cheng and Chong, I finally started the move. We've planned over 50 POI's, and marked them on the map. 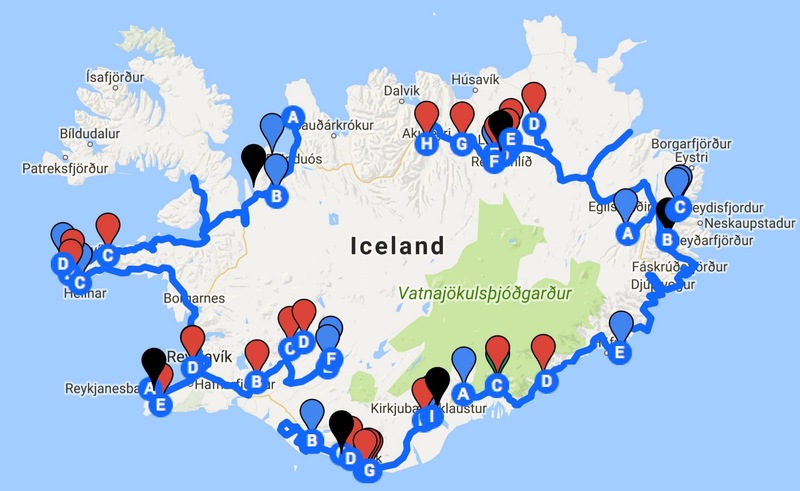 As a summary, we drove counterclockwise along the circumference of the island (Route 1), starting and ending both at KEF. The black icons are the stays, which were really cheap and cozy Airbnb huts and cottages. 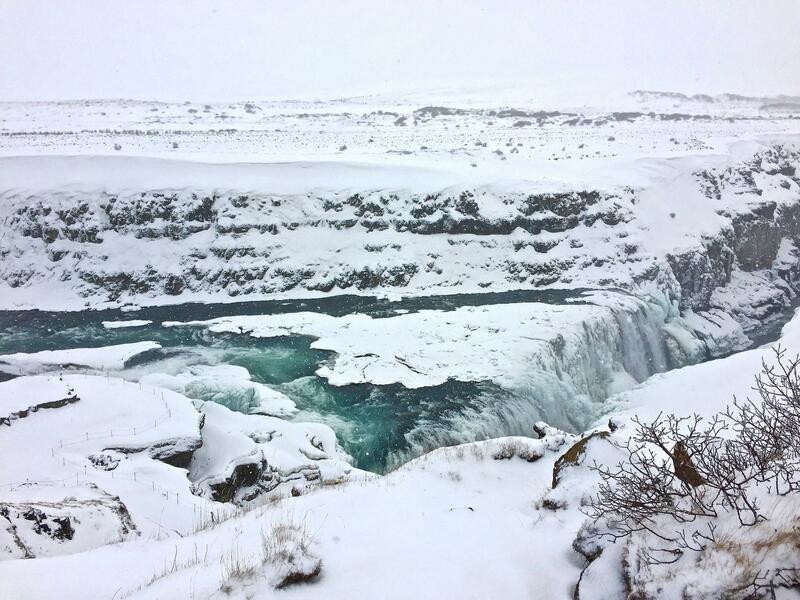 There were multiple risky events during the trip, such as encountering the impassable road, driving in snow storm/strong wind, back slide on a steep cliff, so on and so forth. Anyway, we survived! Below are a few images from the first day of the trip. Click View Gallery at the bottom to view more. 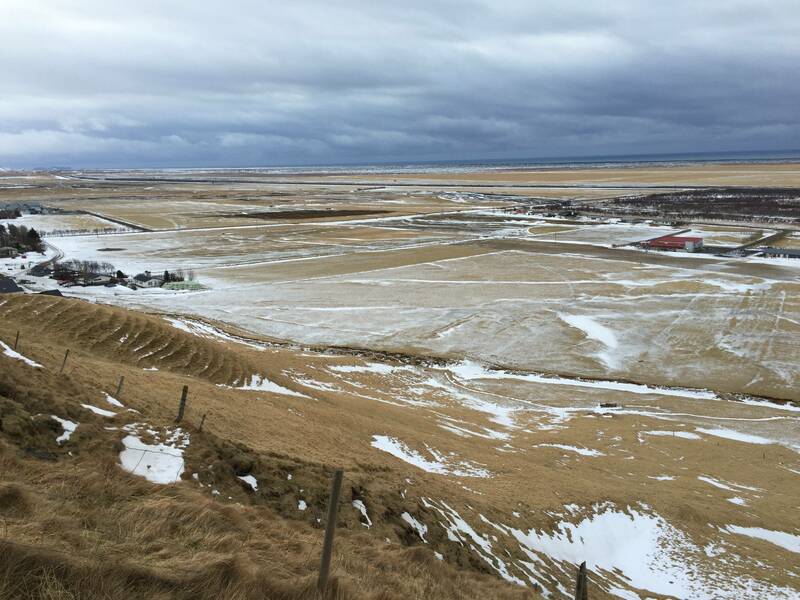 The first impression on Iceland is flat and white. Since it was the end of February, there was the only endless field of white snow on the horizon. Constant view from the shotgun. The crater was the first stop upon arrival. The ground was super slippery, and we felt the coldness kicking in from the wind and snow. 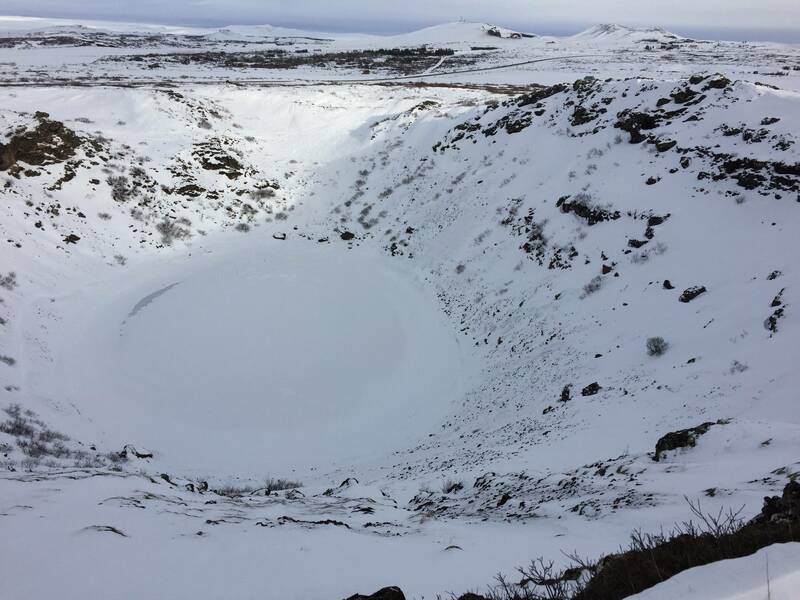 Walking along the rim of the crater was challenging, and there were constantly people falling on the ice. However we managed to get to the bottom and lay on the ice, and it was the first time we realized waist-deep snow is true here in Iceland. 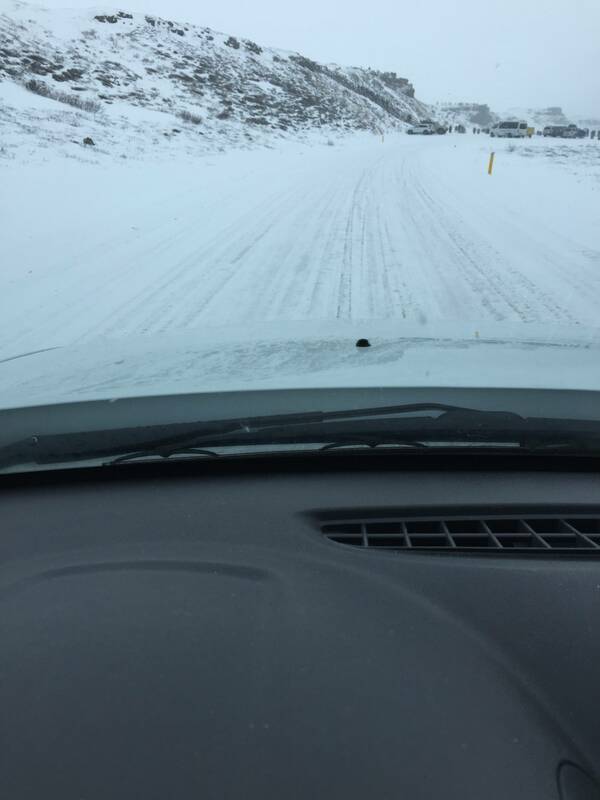 Normal road condition in February Iceland. The first waterfall (foss) we visited. There were plenty of waterfalls later on to see. 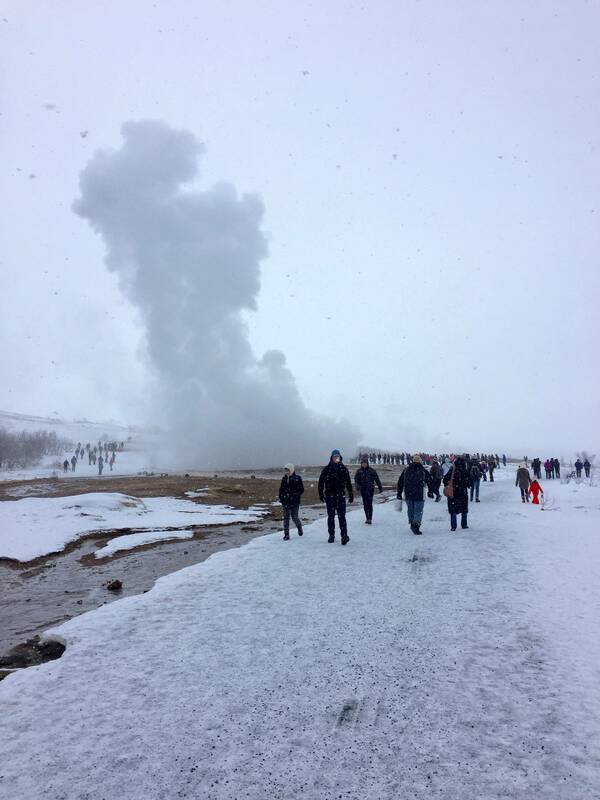 Third stop with jet lag: the geyser. We were lucky enough to capture the eruption on video three times. Well, the road ended here. The snow was deep enough to cover our knees. 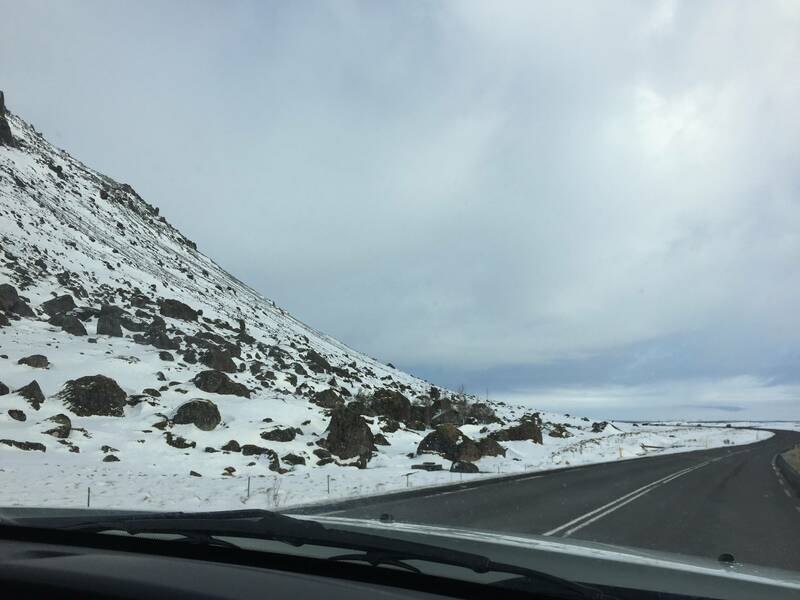 The color of the snow and sky almost made us believe that this road leads to the end of the world. 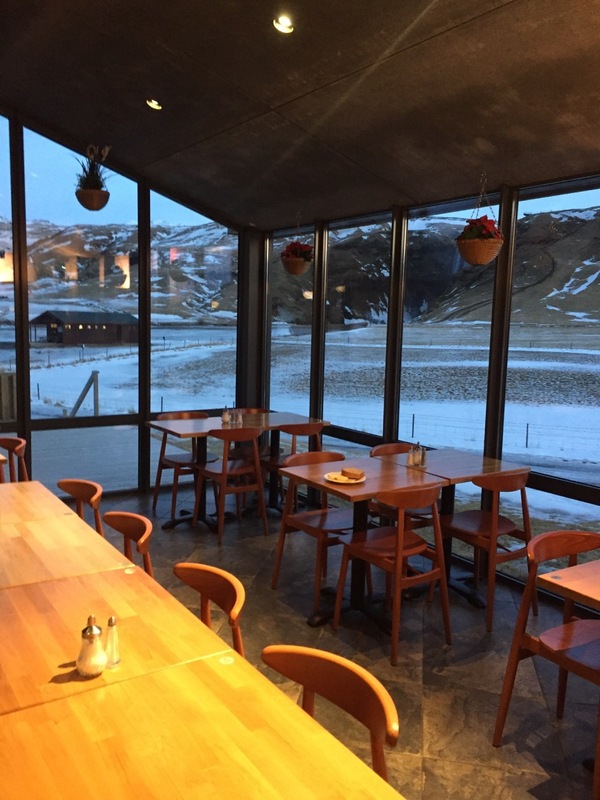 The first night we stayed at a hotel right next to the Skogafoss. 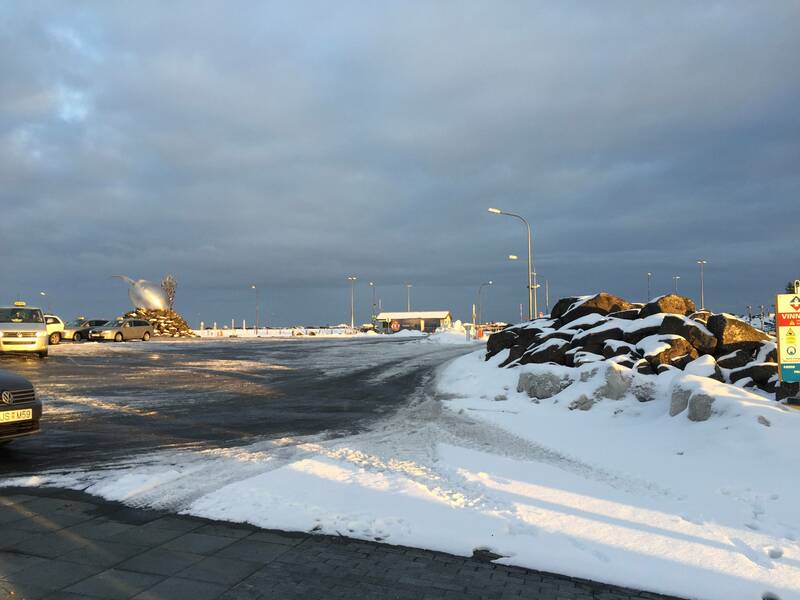 Still jet lagged, we managed to visit the golden circle and stayed at the southmost end of Iceland, racing with the sunlight, which only lasted for less than 10 hours. 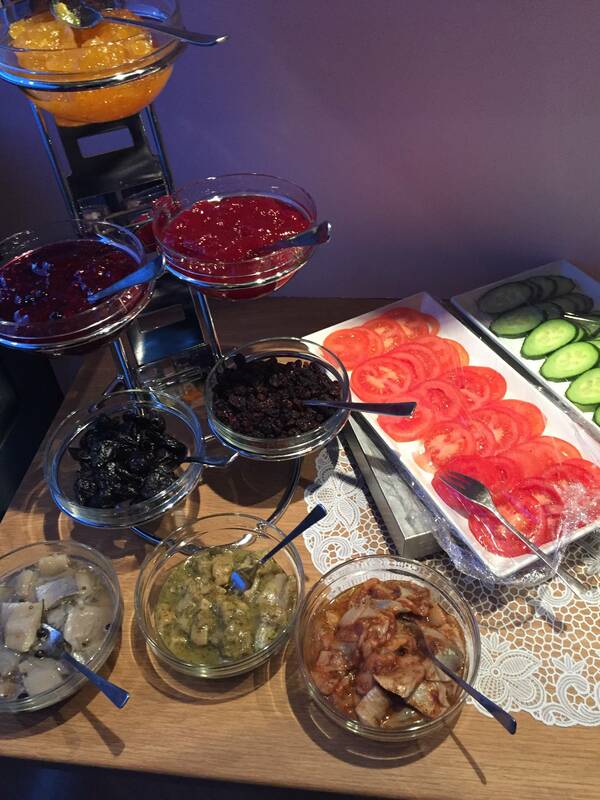 Next morning, the breakfast was really a surprise. You can see the foss in the distance. 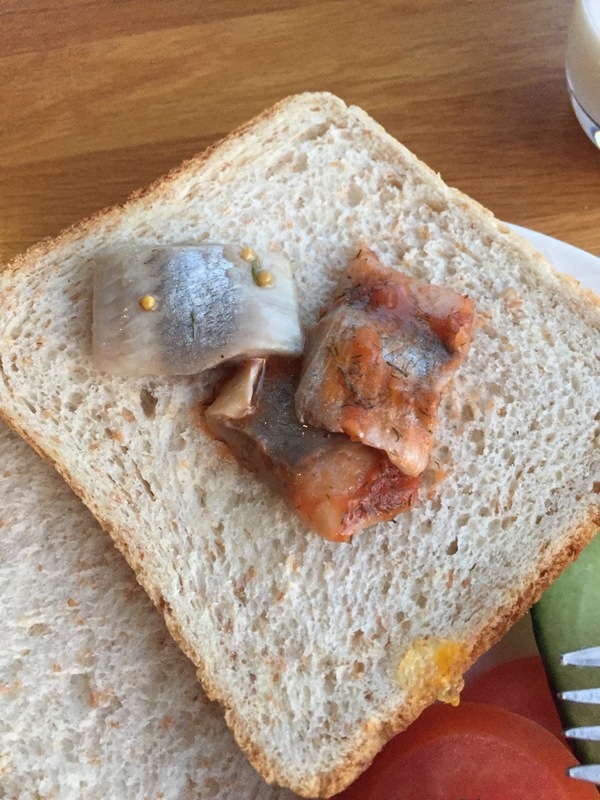 Icelandic marinated fish. Salty and a bit sour, really good match with the plain wheat bread.